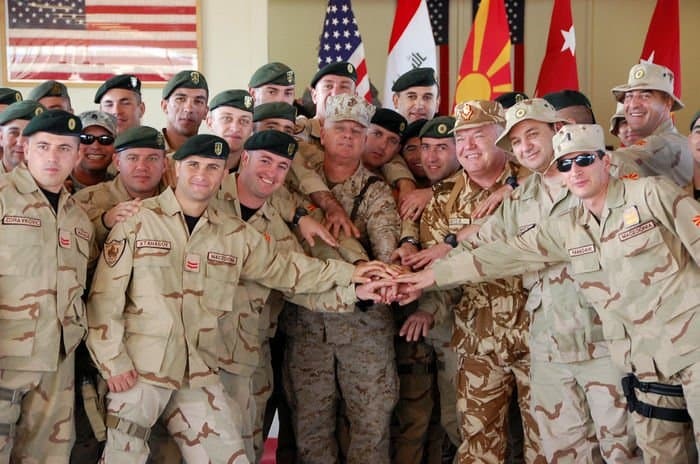 CAMP TAJI, Iraq – After eleven rotations since the beginning months of Operation Iraqi Freedom, the Macedonian soldiers are ending their part of the Coalition Forces mission. The end of mission ceremony was “bittersweet” for Coalition Forces as this longtime partner was closing a chapter on its partnership in Iraq. 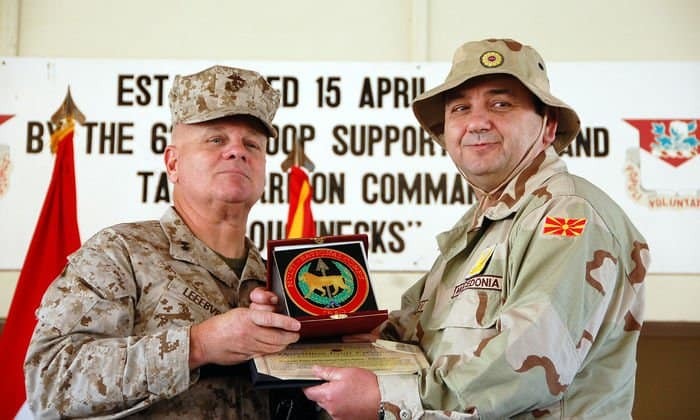 Marine Maj. Gen. Paul Lefebvre (left), deputy commanding general, MultiNational Corps – Iraq, presents the MNC-I medallion to Macedonian Maj. Gen. Zoran Dimov, commander of Joint Operations Command, Macedonian Army, during an end of mission ceremony. The Macedonian soldiers will return home following the eleventh and final rotation in support of Operation Iraqi Freedom. In the past five years, the Macedonian soldiers have fought side by side with the Coalition and have experienced the progress in Iraq. 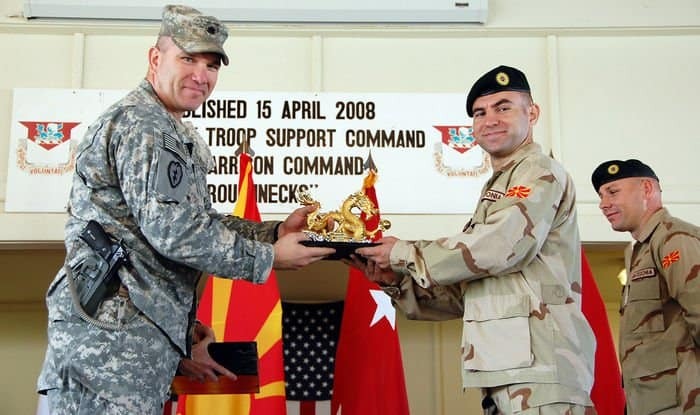 Lt. Col. Thomas Boccardi, commander, 1st Battalion, 14th Infantry Regiment Golden Dragons, 2nd Stryker Brigade Combat Team, 25th Infantry Division, MultiNational Division – Baghdad, presents a golden dragon to Macedonian Capt. Stevan Blagoja Naumoski, Ranger platoon leader, Macedonian Rangers, during an end of mission ceremony at the Schoolcraft Pavilion. Capt. Naumoski’s ranger platoon partnered with the Golden Dragons during the eleventh rotation in support of Operation Iraqi Freedom. The Macedonian-Coalition partnerships grew and provided teamwork that furthered every aspect of the mission in northwest Baghdad. The Macedonian force consists of two platoons: an infantry security platoon and a ranger platoon. Most recently, the infantry platoon provided security controlling entry points into Combined Operating Base Taji while partnered with 2nd Battalion, 11th Field Artillery Regiment. They manned gates and entry points that screened more than 4,000 persons and several thousand vehicles. “The Macedonian platoon was an invaluable asset to our mission. They performed superbly and were truly a combat multiplier,” said Lt.Col. Joseph Gleichenhaus, commander 2nd Bn., 11th FA Regt., who is a native of Honolulu. “More importantly, our partnership allowed by Soldiers to learn firsthand how to work with Coalition Forces. They gained knowledge of another culture and country and built friendships that will last a lifetime. Marine Maj. Gen. Paul Lefebvre (center left) and Macedonian soldiers come together one last time to commemorate an end of mission ceremony at the Schoolcraft Pavilion. The Macedonian soldiers will return home following the end of the eleventh and last rotation in support of Operation Iraqi Freedom. The Macedonian Rangers spent their tour with the 1st Battalion, 14th Infantry Regiment “Golden Dragons,” 2nd SBCT, 25th Inf. Div. The Macedonian accomplishments are far reaching, beyond the time spent with the Coalition Forces. “They can go home knowing the (Iraqi) people have security and a great future. The people of Tarmiyah owe much of their security to the Macedonian Rangers. We will greatly miss them and their relationship as partners,” said Woodruff. The Coalition Forces leaders and Macedonian leaders exchanged gifts, smiles and handshakes during the ceremony.